Aproveche el servicio de ferry diario InterIslander de Picton a Wellington. Cambie la isla sur de Nueva Zelanda por la isla norte, cruzando el estrecho de Cook a la ciudad capital. El ferry Picton-a-Wellington sale de una manera, deslizándose sobre las aguas serenas de Queen Charlotte Sound en un crucero de 3 horas que ofrece impresionantes vistas de ambas islas, la entrada perfecta a la ciudad portuaria colonial. Embárquese en el ferry InterIslander en la pintoresca ciudad portuaria de Picton, y relájese durante el crucero de 3 horas por el estrecho de Cook, en lo que promete ser uno de los viajes en ferry más pintorescos. Viajarás a través de las tranquilas y relucientes aguas de Queen Charlotte Sound, ubicado en medio de un exuberante bosque en el corazón de los sonidos de Marlborough. Deje atrás la Isla Sur durante el servicio de ferry diario a la Isla Norte, donde llegará al puerto de Wellington Harbour. Mientras se ve la capital de Nueva Zelanda, disfrute de un panorama único de las colinas que rodean la animada ciudad marcada por su herencia maorí y colonial. Desembarque en Wellington para disfrutar de algunos de los mejores restaurantes, tiendas, teatros y atracciones de Nueva Zelanda, incluido el famoso Museo Te Papa. 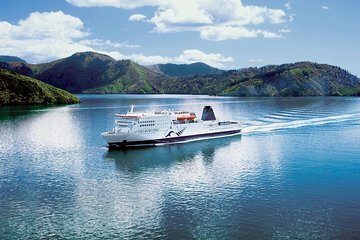 Nota: La opción de ferry InterIslander no permite viajar con su vehículo. Loved it. Although this travel is really about mass transportation, the ride through Cook Strait is breathtaking. The ferry is comfortable and very accommodating with all of it’s cafes and such. There is plenty of room and comfortable seating options. 3 relaxing hours with an awesome crew. The ferry was quite large and there was plenty of seating. There were places to sit at tables to eat, places to sit outside, places you could sit to be more by yourself to sleep or talk. There is a small cafe at the ferry departure station in Picton, as well as on the ferry itself. Return stations for several car rental agencies were right there in the same buildings where you arrive and depart at both Wellington and Picton. You pick up and leave cars in the ferry parking lot. We headed straight to the very front of the ferry and sat in the front row, inside, which for the most part provided good views, although the view was often blocked by those standing outside at the railing. It was easy to go outside and take pictures and come back and sit and relax. The port at Picton was particularly beautiful! It was a ferry trip, nothing more, nothing less. However, this return trip the last one of the day was much more comfortable than the morning ferry to Picton. The food selection was better, as well. Because it was dark, there was no scenery to be viewed. The food and comfort level made up for it, however. This is a great way to get from one island to the other. Very relaxing and incredible views. Good service.Not a great lot of seating areas. On time, smooth sail, easy embark-disembarking process, comfortable lounge seating, decent food. A wonderful way to travel between the two islands. The weather was really good and the views amazing. We stayed overnight in Picton which was a beautiful place. Thank you for arranging the travel for us at a very reasonable price.